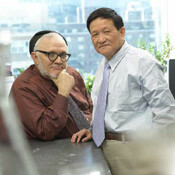 Chemist Samuel Danishefsky (left) and pharmacologist Ting-Chao Chou have collaborated closely on the study of epothilone drugs. From antibiotics to painkillers to cancer drugs, many molecules found in nature have proven to be remedies for human disease. At Memorial Sloan Kettering, a handful of drugs now in clinical trials have been derived from sources ranging from microorganisms to plants to marine creatures. The theory behind the development of drugs from natural products is that these molecules inherently have some kind of biological function, and that function can be enhanced and exploited to develop effective treatments for patients. From the earliest days of traditional medicine, plants have been used to treat ailments and ease suffering caused by disease. The pharmaceutical industry had its origins in the late 19th century when it began to manufacture medications such as aspirin and morphine, which were initially found in nature. Two of the earliest successful cancer drugs, vinblastine and vincristine — both conceived in the 1950s to treat leukemia and still used today — were developed from molecules isolated from the Madagascar periwinkle. This prompted the National Cancer Institute in 1960 to initiate a large-scale project to collect samples from plants and marine organisms all over the world and test them for antitumor activity. Today, more than 60 percent of all cancer drugs are derived from or inspired by compounds found in nature. “Some of the best cancer drugs on the market today originally came from plants,” said Memorial Sloan Kettering Cancer Center medical oncologist Gary K. Schwartz, citing paclitaxel (Taxol®) — which is used to treat tumors including breast, ovarian, and non-small cell lung cancers — and irinotecan (Camptosar®) —- which is used primarily to treat colorectal cancer — as two examples. “The reason that plants or animals create these compounds could be as a protective mechanism of evolution — a response to some kind of noxious stimuli, such as bacteria or viruses. In nature, these molecules kill foreign substances, and in the same way they can kill cancer,” he said. For the past several years, much of Dr. Danishefsky’s work has focused on the synthesis of a class of drugs called the epothilones. Epothilones come from the bacterium Sorangium cellulosum, which was originally isolated from soil found on riverbanks in Africa. The epothilones use the same mechanism that paclitaxel and its semisynthetic variant docetaxel (Taxotere®) do to block the formation of the mitotic spindle, which is an essential part of cell division. However, in the test tube and in mouse models of cancer, the epothilones appear to be less toxic to healthy cells than some other drugs and have the ability to destroy tumors that have developed resistance to paclitaxel and other drugs. Dr. Danishefsky was the first to synthesize the key epothilones in the laboratory and has since created more than 100 analogs — molecules that are similar but have different chemical groups attached. One epothilone analog that appears particularly promising in preclinical research is Fludelone, which has been studied for its effectiveness in killing cancer cells, including breast, ovarian, colon, prostate, leukemia, and multiple myeloma. Clinical trials for Fludelone have not begun, but the Center has been involved with early trials of two other epothilone drugs. Another natural-product drug developed at Memorial Sloan Kettering Cancer Center is 17-AAG, a derivative of the antibiotic geldanamycin, isolated from the microorganism Streptomyces hygroscopicus. A “targeted therapy,” 17-AAG inhibits heat-shock protein 90 (HSP90), which plays an important role in cell growth and survival. Neal Rosen, a medical oncologist and researcher in the Molecular Pharmacology and Chemistry Program, has been studying the drug for the past decade. In several research projects, led by David B. Solit, who was then a research fellow and is now an assistant attending physician at Memorial Sloan Kettering Cancer Center, members of Dr. Rosen’s laboratory did much of the preclinical work demonstrating that the drug was safe in animal models and effective at killing a number of tumors, including those with mutations in the genes HER2/neu, BCR-ABL, or BRAF. In 1997, Memorial Sloan Kettering Cancer Center structural biologist Nikola P. Pavletich published a paper revealing the structure of the HSP90 protein and showing how geldanamycin binds to it. Investigator Robert Maki is studying a sarcoma drug isolated from a type of sea squirt. The first clinical trials began in 1999. Several studies are now underway evaluating 17-AAG, both alone and in combination with other drugs, for a variety of cancers including prostate and gastrointestinal tumors and melanoma. According to Dr. Rosen, the drug appears to be especially promising in fighting breast cancer when used in combination with trastuzumab (Herceptin®) in patients who have developed resistance to trastuzumab. In addition, Memorial Sloan Kettering Cancer Center chemist Gabriella Chiosis has created a new small-molecule drug inspired by 17-AAG that looks nothing like it but binds to HSP90 in the same way. Researchers hope this drug may overcome some of the side effects of 17-AAG, including liver toxicity, and trials are expected to begin soon. Memorial Sloan Kettering Cancer Center medical oncologist Robert G. Maki is studying the drug ET-743 (trabectidin or Yondelis®) for the treatment of sarcoma, a cancer that affects the soft tissues of the body. ET-743 is a neurotransmitter molecule that is isolated from a sea squirt, Ecteinascidia turbinata. It was originally identified in the Caribbean in the early 1980s and found to be effective at killing a variety of cancer cells in the test tube. The drug is made by growing thousands of pounds of the invertebrates in aquaculture and extracting the compound from their bodies. Early trials found that the response rate to ET-743 is low, with only about ten percent of tumors showing significant shrinkage. “But in two of the most common types of sarcoma, the drug occasionally works brilliantly,” Dr. Maki said. These types are leiomyosarcoma (tumors of smooth muscle) and liposarcoma (tumors that originate in fat cells). The drug works by binding to the minor groove of DNA, thus changing the DNA’s configuration and altering gene transcription. “This drug really stands out as a novel agent for the treatment of sarcoma because it is a natural product,” Dr. Maki said, explaining that most other sarcoma drugs currently in development are tyrosine-kinase targeted therapies. ET-743 is currently in trials designed to determine the best way to administer the drug as a single agent, and investigators have begun evaluating it in combination with other drugs — including the natural products paclitaxel and doxorubicin (Adriamycin®). Researcher Gary Schwartz is evaluating several natural-product drugs. Another anticancer drug that Dr. Schwartz has studied is bryostatin-1, which is isolated from a type of sea moss. However, clinical trials on that drug were discontinued because patients who took the drug suffered from severe muscle aches, and researchers are now looking for versions of the drug that have the same cancer-killing ability without the side effects. Sparked by an $8.1 million grant from the National Institutes of Health, Memorial Sloan Kettering Cancer Center — through its Integrative Medicine Service, led by Barrie R. Cassileth — has begun another initiative to study natural botanical products used in traditional medicines around the world, primarily for their effects on the immune system. Several Memorial Sloan Kettering Cancer Center investigators are involved in these studies, including Philip O. Livingston, Nai-Kong V. Cheung, Michael S. Glickman, and Eric G. Pamer. Dr. Schwartz also has begun studying an herb called huanglian, which is used in traditional Chinese medicine and which, like flavopiridol, is a cell-cycle inhibitor. But unlike most natural product drugs, which are molecules isolated from their original source, huanglian is being studied as a whole herb. “There are seven active components, and it appears the whole herb is needed to kill cancer cells most effectively,” he explained.